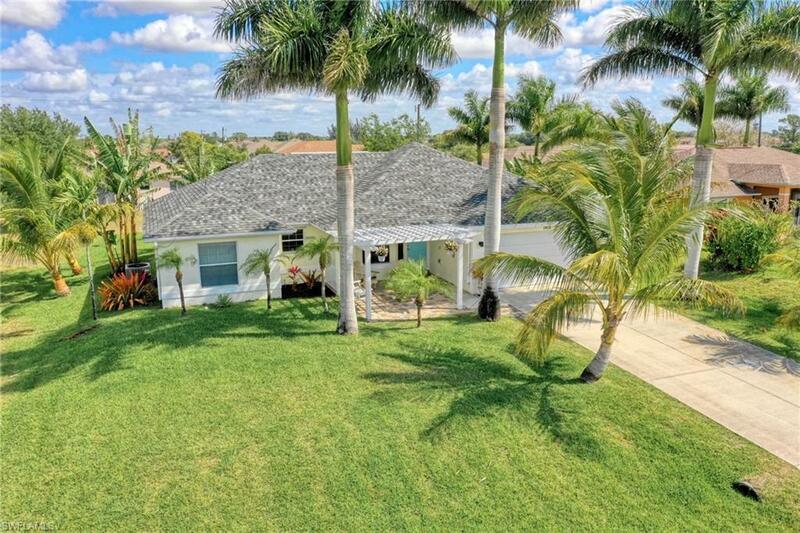 Don't miss on this fantastic NE Cape Coral, Florida home complete with elegant, tall palm and coconut trees!! This beautiful open concept home features 3 bedrooms, 2 baths, has over 1500 sq ft of living space, a large open floor plan, and a spacious front courtyard that is perfect for entertaining. The recently remodeled eat-in kitchen features stainless steel modern appliances, a large breakfast bar, a wine rack, lots of counter space, and a beautiful tile back-splash. Enjoy relaxing in the large family room that offers lots of natural light and vaulted ceilings. Home is Florida summer ready with manual aluminum shutters. Roof was replaced in 2018 and the AC was replaced in 2015. This house is move in ready.